Join us for a screening of the award winning documentary Merchants of Doubt followed by a panel discussion about climate denial and the importance of media literacy. Faculty from Saint Joseph’s and Temple Universities and representatives from the National Association of Media Literacy Education will give their perspectives and answer questions. This topic is critical in a time when the veracity of science is being questioned and the facts can be confused with “alternative facts.” Join us in understanding how “spin” can create confusion, jeopardizing the health of people and the planet. This event is open to students, faculty, K-12 teachers, school board members, community members and all who are interested in making sure that the consequences we suffered for the lies the tobacco companies perpetrated through the media don’t happen to us again with Climate Change! Parking: Parking is available at the Hawk’s Landing parking garage, 2461 N. 54th Street, Philadelphia. The Cardinal Foley Center is at the main entry to campus at City Avenue and Cardinal Avenue (Merion side of campus). President Donald Trump announcing the U.S. withdraw from the Paris Climate Accord. Photo courtesy of CNN. President Donald J. Trump has received well-deserved condem­nation from leaders of many nations, governors and mayors, environ­mentalists, corporate CEOs, Jewish and other religious organizations, and others, for withdrawing the United States from the 2015 Paris climate change pact that was agreed to by all the 195 nations that attended, including Israel and the United States. How should Jews respond to the U.S. withdrawal? Science academies worldwide, 97% of climate scientists, and 99.9% of peer-reviewed papers on the issue in respected scientific journals argue that climate change is real, is largely caused by human activities, and poses great threats to humanity. All 195 nations at the December 2015 Paris climate change conference agreed that immediate steps must be taken to combat climate change. Every decade since the 1970s has been warmer than the previous decade and all of the 17 warmest years since temperature records were kept in 1880 have been since 1998. 2016 is the warmest year globally since 1880, when temperature records were first kept, breaking the record held before by 2015 and previously by 2014, meaning we now have had three consecutive years of record temperatures..
Polar icecaps and glaciers worldwide have been melting rapidly, faster than scientific projections. This has caused an increase elevation in oceans worldwide with the potential for major flooding. There has been an increase in the number and severity of droughts, wildfires, storms, and floods. California has been subjected to so many severe climate events (heat waves, droughts, wildfires, and mudslides when heavy rains occur) recently that its governor, Jerry Brown, stated that, “Humanity is on a collision course with nature.” California serves as an example of how climate change can wreak havoc. Many climate experts believe that we are close to a tipping point due to positive feedback loops, when climate change will spiral out of control, with disastrous consequences, unless major positive changes soon occur. While many climate scientists think that 350 parts per million (ppm) of atmospheric CO2 is a threshold value for climate stability, the world reached 400 ppm in 2015, and the amount is increasing by 2 – 3 ppm per year. While climate scientists hope that temperature increases can be limited to two degrees Celsius (3.6 degrees Fahrenheit), largely because that is the best that can be hoped for with current trends and momentum, the world is now on track for an average increase of 4 – 6 degrees Celsius, which would result in great human suffering and significant threats to human civilization. The Pentagon and other military groups think that climate change will increase the potential for instability, terrorism, and war by reducing access to food and clean water and by causing tens of millions of desperate refuges fleeing from droughts, wildfire, floods, storms, and other effects of climate change. denial about climate threats and the urgency of working to avert them on the part of the vast majority of Republicans, but so far with very limited success. Genesis 2:15 indicates that the human role is to work the land but also to guard and preserve it. Jews are mandated to be shomrei ha’adama, “guardians of the earth,” co-workers with God in working for tikkun olam, healing and repairing the world. The Jewish sages extended Deuteronomy 20:19, 20, prohibiting the destruction of fruit trees in wartime to build battery rams to overcome an enemy fortification, to make a general prohibition against unnecessarily destroying anything of value. Jews participating in 2014 climate march. Photo by Jon Leiner. Given the above, Jews should be in the forefront of efforts to help avert a climate catastrophe. We should strive to make tikkun olam a central focus of all aspects of Jewish life today. We should try to significantly reduce our individual carbon footprints by recycling, using efficient light bulbs and other items, eating less meat, reducing our use of automobiles by walking, biking, sharing rides, and using mass transit, when appropriate, and in other ways. We should actively support efforts to increase efficiencies of automobiles and other items, shift to renewable sources of energy, and other societal steps that reduce greenhouse emissions. We should try to arrange programs on climate change at synagogues, Jewish centers, and other Jewish venues, write letters to editors, speak to family members, friends, neighbors, an co-workers, and take other steps to increase awareness of the seriousness of climate threats and how applying Jewish values can help reduce them. In summary we should do everything possible to reduce climate change and to help shift our imperiled planet onto a sustainable path. Recently elected French President Emmanuel Macron denounces Trump’s climate skepticism and announces a website offering four-year grants of to American researchers, businessmen, teachers and students to work in France on climate change. I have a message for you guys. The good news is that according to the latest IPCC report, if we enact aggressive emissions limits now, we could hold the warming to 2°C. 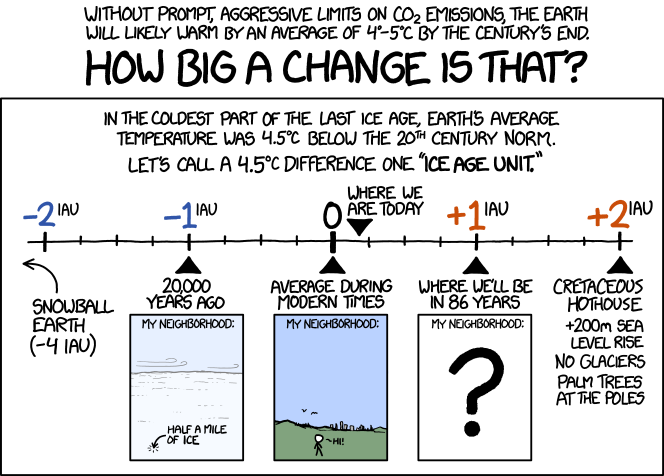 That’s only half an ice age unit, which is probably no big deal. Fighting the climate change is probably the most important issue facing our generation. Many people of good will would like to do their part to address this problem, but don’t really know where to start from. Unfortunately, there is a lot of disinformation out there, which leads people to take steps that might make them feel “green,” but don’t really help much, if at all. Accordingly, this is the first of a series of articles giving examples of “green” initiatives that do little other than distract, along with ideas about what we should be doing instead. This installment is all about drinking water. Future articles will delve into paperwork and electricity. Please send me feedback on these articles along with your ideas. First part of series follows the jump. Enjoy a drink and refill your bottle here! Tap is regulated by the EPA, and held to stricter safety standards than bottled water. Tap keeps plastic waste out of landfills and oceans. Tap protects the privatization of a basic human right. Tap avoids plastic bottle production, which relies heavily on petrochemicals and fossil fuels for raw materials, manufacture, and transport. Tap only costs $0.002 per gallon. Led by students, Hampshire college ended the sale of bottled water on campus in Fall 2012. The municipal waters in the areas where most of us live are perfectly healthy to drink, and yet many of us choose to drink bottled water. 20 billion barrels of oil go annually into making the water bottles that Americans throw out, creating 25 million tons of greenhouse gases. Nestlé’s bottled water comes from Dallas, Texas, meaning that we are simply substituting Dallas water for Philadelphia water, and paying the supermarket and polluting the environment for the privilege. Other waters come from more exotic locations like Fiji. It is still the same H2O by another name, but it is being shipped around the world to quench our thirst. To reduce the global environmental impact of PET bottles, Nestlé Waters created a new generation of packaging: the Eco-Shape PET bottle. True, their new bottle is 25% lighter than its predecessor — largely due to a shorter bottle cap. Nevertheless, 25% lighter is still 75% too heavy compared to the truly environment-friendly alternative of a reusable water bottle, canteen or cup. In fact, the smaller cap makes the bottle more difficult to reuse, and is more prone to being swallowed by small children. Oddly enough, most of our National Parks continue to sell bottled water, even though they have some of the most pristine water in the country on site. In fact, 30% of the Grand Canyon National Park’s recycling waste used to come from disposable bottles before it has gone bottled water-free. (NJDC) Below are ten documented things every American Jew should know about former Massachusetts governor and presidential candidate Mitt Romney; follow the links to view supporting materials. Questions linger surrounding the Iran-tainted assets of Romney’s charity, even as President Obama places unprecedented pressure on Iran. With each passing month, Romney has disagreed more and more with the scientific consensus regarding global climate change. Romney vehemently opposed the President’s contraception compromise, which will ensure that women’s preventive services are widely available while addressing religious liberty concerns. This compromise was praised by groups ranging from the Catholic Health Association to the Orthodox Union. During nationally-televised debates, Romney has engaged in outright lies surrounding the President’s record on Israel, and he uses Israel as a partisan wedge issue whenever possible. While 76% of Jews support gay marriage and even more support gay rights, Romney doesn’t just oppose gay marriage — he has chosen to engage in gay-baiting rhetoric in front of conservative crowds. Romney told CNN, “yes, I would vote for” the anti-Israel Ron Paul for president if Paul were to become the GOP nominee. Romney’s flip-flops are legendary; for example, he supported key elements of the Affordable Care Act — including the individual mandate — but he now promises to dismantle it. As the front page of The Washington Post has recently noted, Romney has formed a “strategic partnership” with the anti-Israel Ron Paul.